Ford Ranger - custom built-in for riverine police. Two-floor pull out system to make the most of the truck bed. Available for any type of pickup truck! Tatra 815-6, 6x6 with cummins engine, automatic transmission Twin disk. High quality assistance and servicing makes it possible to repair a customer’s vehicle directly in the field, unless it relates to a severe vehicle accident. ALFAVARIA TOOLS built-in mobile servicing systems afford quick management of all repairs on the ground. They provide a perfect background for your work. We consult the draft design and implementation of the workshop with you, and try to meet all of your needs and wishes. Quick repair of vehicles on the ground, on roadways. Optional function as a mobile tyre service or car service – servicing at the customer’s location. We will install the servicing workshop in your utility vehicle, delivery van, or lightweight truck. 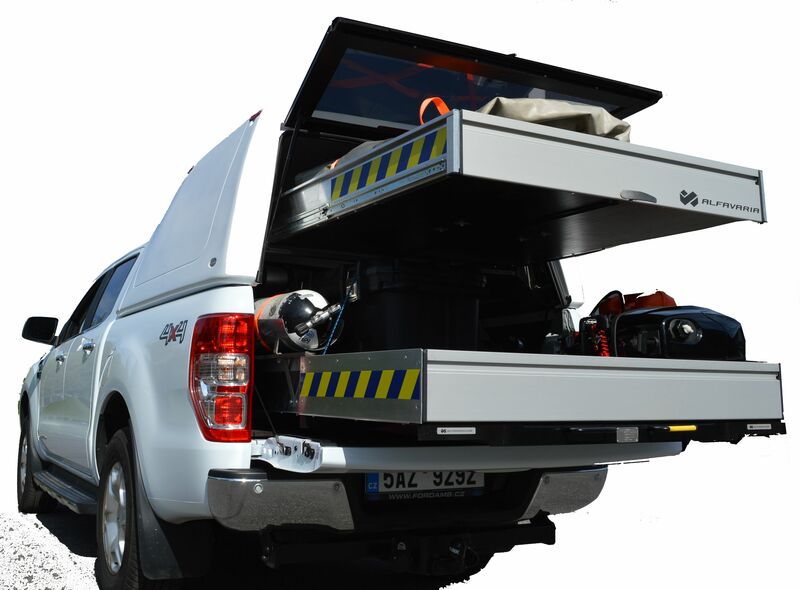 The built-in systems 100% aluminium design guarantees a low weight, which provides greater effective vehicle load. We make maximum use of the utility space: as such, sufficient space for handling and work remains. Among common adjustments and modifications are wiring, air conditioning, heating, and insulation. You can select colour coating, both the exterior as well as interior – for example to match your corporate or warning colours. Look at the list of many other possible modifications of built-in mobile systems. Built-in additions in servicing vehicles are equipped with a wide assortment of high quality tools. We can adapt them to any repair deployment. We place hand, electric, and pneumatic tools in the service workshop, along with accessories for welding, a compressor, generator, tyre lever and balancer, and many other components. View the internal equipment options. An important factor when designing built-in systems is also the safety of stored material. We pay particular attention to securing safety of mechanics, while considering ergonomics and ease of use. We complement the built-in systems with high quality professional workshopshop furniture with many safety features, for example with drawers that extend 100% as well as stops to prevent accidental ejection. Mobile workshops contain modules for safe placement of material, shelf components with hinged stops. Review the comprehensive overview and mobile aluminium furniture options. Wide selection of accessories allows you to convert your built-in system into a perfect car service or tyre service station. As an example, we mention aluminium and unbreakable cases, dust and water-proof boxes, hose holders, telescopic support rods, hooks, and dividers. Choose from a wide selection of accessories. We design individual solutions for each customer, which we consult with you. We take care of complete servicing. We teach mechanics how to fully use all of the benefits of the built-in system. Our long-standing experience with delivering tools and workshop equipment for professional and industrial production makes us uniquely qualified for consultation and proposing of suitable tools and equipment. We enjoy our work, and your satisfaction is our goal. Contact us and ask about our price offer at no obligation. Send us your inquiry and take advantage of all the benefits that we provide our customers. We look forward to serving you and to fulfilling your wishes.